For many Filipinos, the Lenten season is a time to not only reflect on the sacrifices of Christ but also a time to get away from the hustle and bustle of everyday life. Holy Week is one of the longest, and most anticipated holidays in the Philippines, and deciding where to go to celebrate it is cause for much excitement. If you’re stressing out because you do not have a plan in place for Lent this year, we have you covered. Whether you decide to stay in Metro Manila, or venture elsewhere, there are plenty of activities to enjoy. 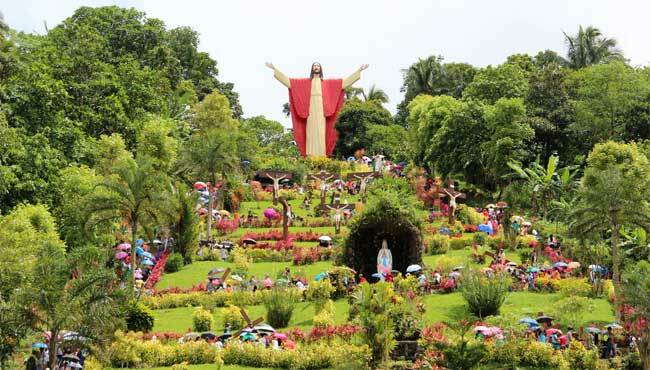 If you’re looking for the perfect place to spend Holy Week this year, be sure to check out these suggestions. 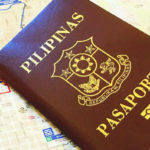 If you are like thousands of other Filipinos, you may practice Visita Iglesia during Holy Week. Visita Iglesia, which symbolizes the fourteen stations of Christ’s passion, gives you an opportunity to visit and pray in at least seven different churches on Holy Thursday. There are a number of top churches you should consider visiting during your Visita Iglesia outside of Metro Manila, all will be beautifully decorated and sure to make your trip a memorable experience. Ilocos Norte and Ilocos Sur are sister provinces that are very popular destinations during Holy Week due to their beautiful natural surroundings and century-old churches. 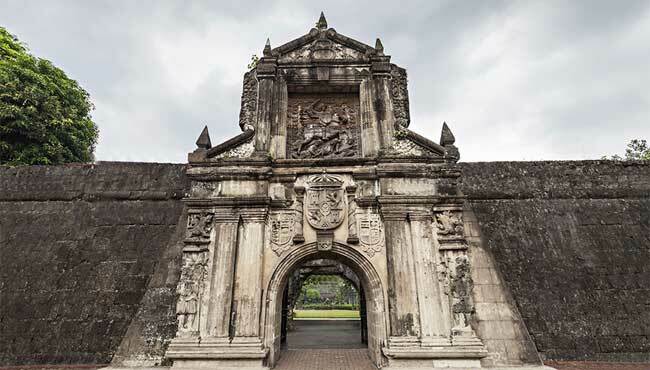 Filipinos travel near and far to be inspired by the age-old beauty of the structures, which date all the way back to the Spanish era. 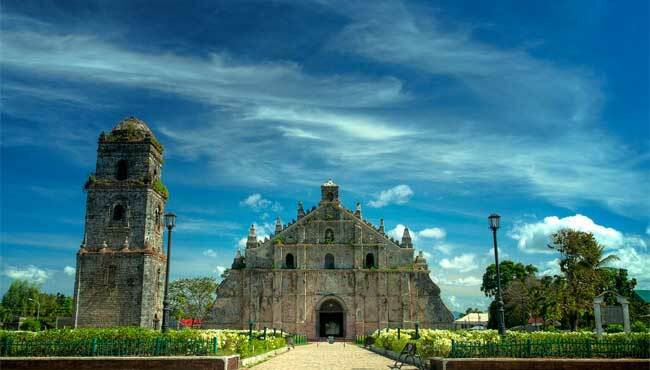 Ilocos Norte and Ilocos Sur is the perfect destination for Visita Iglesia, and it is only an eight-hour drive from Metro Manila. Siquijor is a great destination for those who wish to truly get away this Holy Week. Siquijor has long had a reputation for being a place of magic, and the island province’s scenery is nothing short of magical. 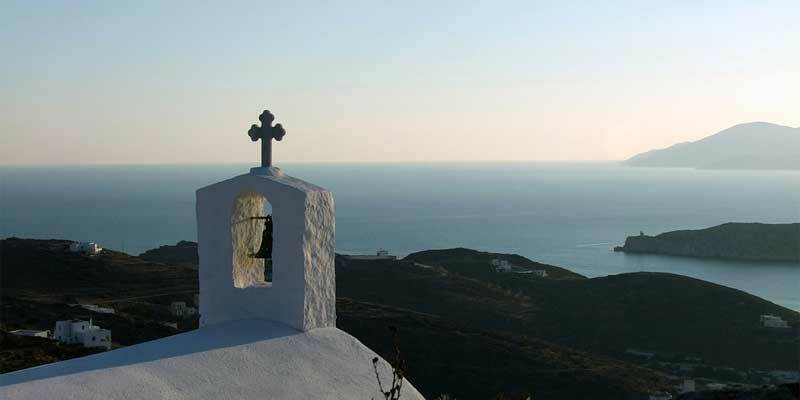 The island’s Healing Festival perfectly coincides with Holy Week, providing a unique experience for the entire family. The Healing Festival is a four-day event that is celebrated by multiple church services, holy treks, and even healing sessions. Siquijor is a 27-hour drive from Metro Manila; however, you can get from Manila to Dumaguete via plane in only one hour. Once you reach Dumaguete, you must take a ferry to Siquijor. Though this trip is quite the excursion it is definitely worth the travel time and money spent. 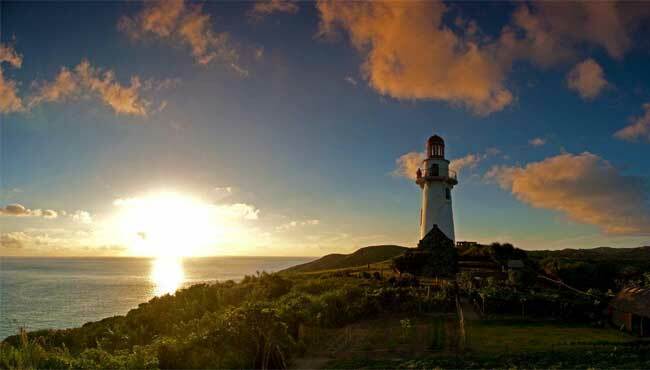 Another option if you are truly looking to get away from Metro Manila is Batanes. Batanes is in the northern Philippines and is 657 km from Metro Manila, thus the best way to get to Batanes is via plane. Though getting to Batanes will require quite a travel, it is the ultimate Holy Week retreat. Often labeled as the New Zealand of the Philippines with its serene and picturesque sights, it’s the best place to revitalize and reflect in time for Lent. Locations, where you can enjoy moments of reflection, include Chawa Cave, Mount Iraya, and the Itbayat, Sabtang, and Batan Islands. Chances are you know someone who has been to Pampanga during Holy Week and has come back with many stories to tell. Pampanga is filled with historical churches and religious shrines that people travel from all over the world to admire. What makes Pampanga a destination of choice for many Filipinos during Holy Week are the numerous reenactments of the crucifixion of Christ. If you have not made your way to Pampanga during Holy Week, make it your number one choice this year. Best of all, Pampanga is only 81.8 km away from Metro Manila, and you can get there by car in a little over an hour and a half. If you’re looking for a place to truly get away from the busy life of Metro Manila this Holy Week, Marinduque is a great option. 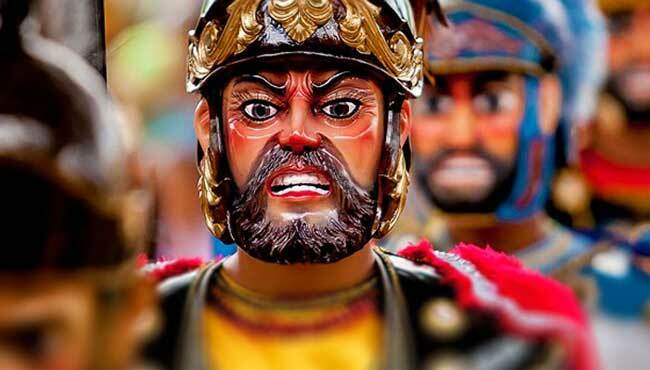 During Holy Week, Marinduque celebrates the Moriones Festival, which is an iconic portrayal of the Legend of Longinus. 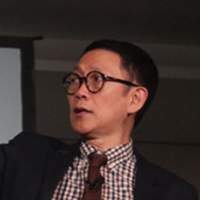 The Legend of Longinus is a story of a blind Roman Centurion who was able to pierce the crucified body of Christ and had his vision restored by Christ’s blood. Marinduque is 159 km away from Metro Manila, and the best way to get there is by ferry or plane. 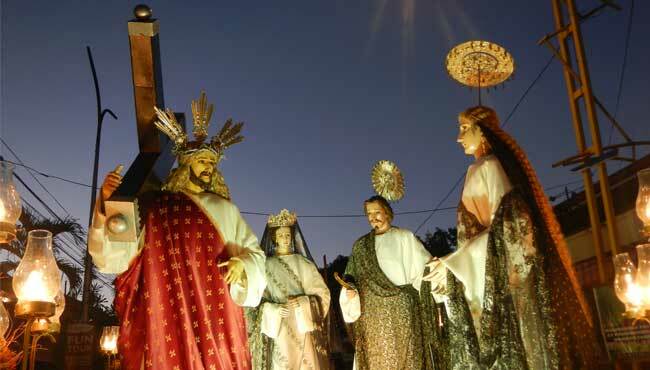 Cebu is another popular Holy Week destination for those who wish to get far away from Metro Manila during Holy Week. There is plenty to do in Cebu, including diving in the crystal-clear waters and visiting some of the prettiest churches the Philippines has to offer. 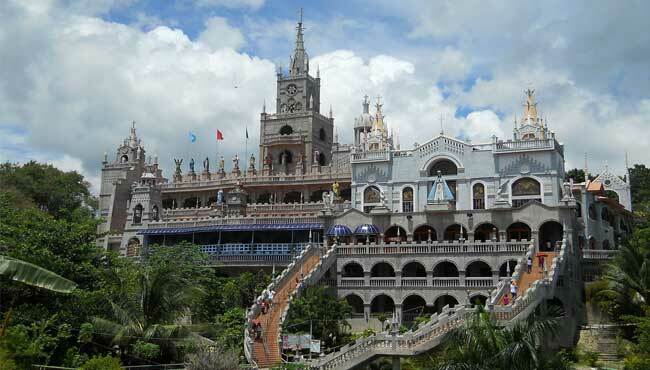 If you visit Cebu, be sure to visit the Simala Church, which is known for its prestigious castle-like look. Cebu is also home to the Monastery of the Holy Eucharist, which is an attraction that draws people from all over the world. 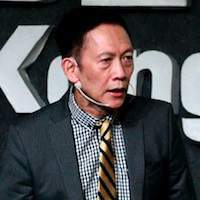 As the second metro city in the Philippines, Cebu is over 350 km away from Metro Manila, making the flight the quickest way to get there with multiple flights available during the day. If you’re looking for old churches for your Visita Iglesia, there is no better place than Bulacan. Some of the more notable historic churches include the Church of Santiago Apostol, St. Monica Church, and Barasoain Church. You can also attend Good Friday Processions in Baliuag where you can watch the procession of nearly 100 floats. Bulacan is only 81.2 km from Metro Manila, and you can reach it by car in a little over two hours. If traveling is out of the question for you this Holy week, there are plenty of churches you can visit to complete your Visita Iglesia. Intramuros is in close proximity within Metro Manila, making it the perfect option for the budget-minded Filipino. Here you can view miraculous churches and cobblestone streets. If you haven’t been, you will truly feel like you are in a different world. The Manila Cathedral is a church you have to visit this Holy Week if you haven’t previously paid it a visit. Located inside Intramuros, this historic cathedral was damaged on many occasions since it was originally built in 1581, but was completed for the last time in 1958. The Manila Cathedral is the perfect place for the entire family to enjoy during Holy Week. Like the Manila Cathedral, the Quiapo Church is worth a visit this Holy Week. 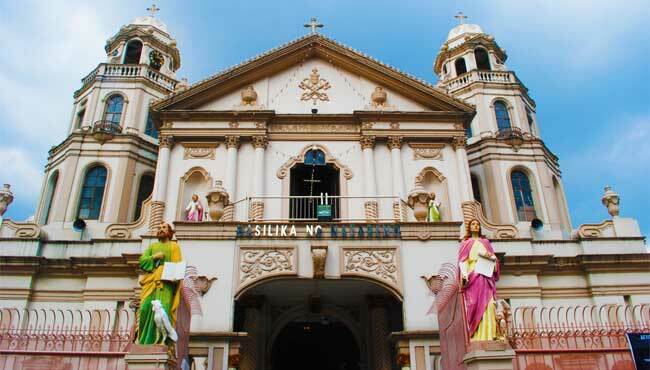 This church is home to the world-famous shrine of the Black Nazarene. 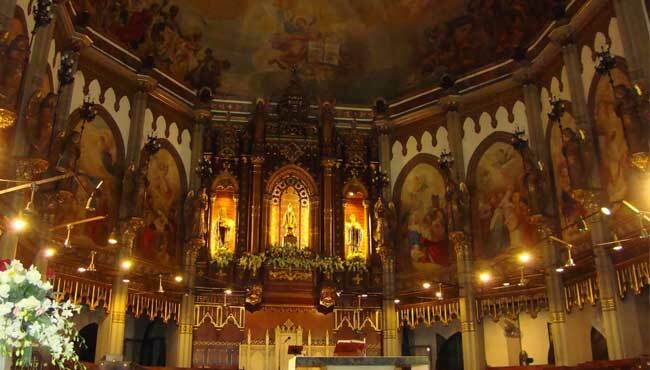 There are daily masses held at the Quiapo church, making it a perfect addition to your Visita Iglesia list. 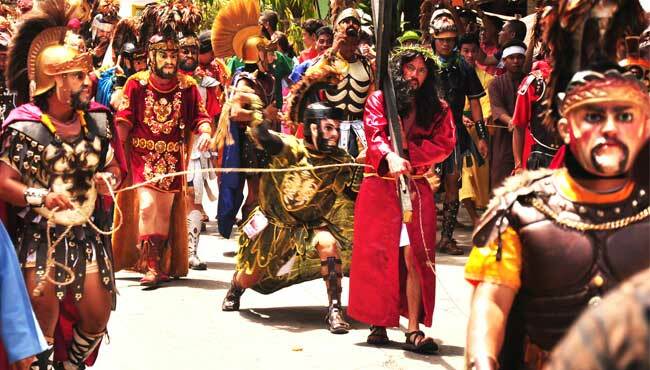 The Moriones Festival is held in beautiful Marinduque, where the streets come alive and turn into a street theatre during Holy Week. The Moriones Festival has inspired additional performances all across the Philippines that take place up until Easter Sunday. At the Moriones Festival, you will have an opportunity to tour some of the island’s most famous and awe-inspiring attractions. 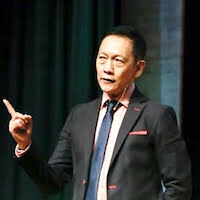 This is the perfect event for someone looking to indulge in some of the Philippines richest culture. The Stations of the Cross or Via Crucis, latin for “Way of the Cross”, is a popular Holy Week event that takes place every year on Good Friday in Cebu City as well as other locations in the Philippines. Also known as “Via Dolorosa” or Way of Sorrow, it depicts the act of following Christ through different stations commemorating his passion that leads to his crucifixion. This historical event helps Filipinos from all over become better acquainted with themselves and their religion. 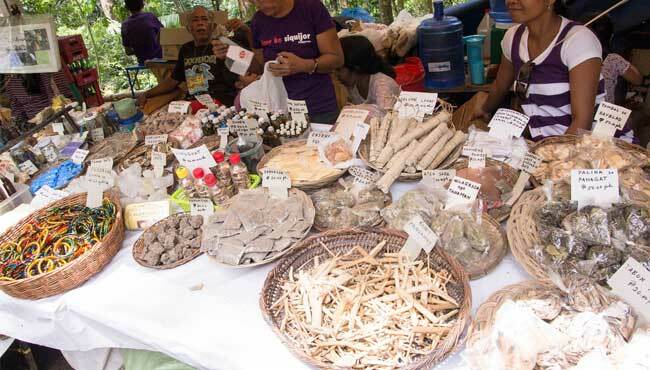 This year, Via Crucis takes place on April 14th, and is an event you do not want to miss if you plan to travel far away from Manila this year. Many Filipinos use Holy Week as a time to travel and spend time with family, visiting faraway places to take a break from the fast-paced Manila lifestyle. 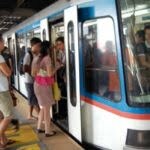 Others opt to stay near Metro Manila to enjoy a less crowded city. If you plan to travel away from Metro Manila consider visiting Ilocos Norte and Ilocos Sur, Siquijor, Batanes, Pampanga, Marinduque, Cebu, or Bulacan. 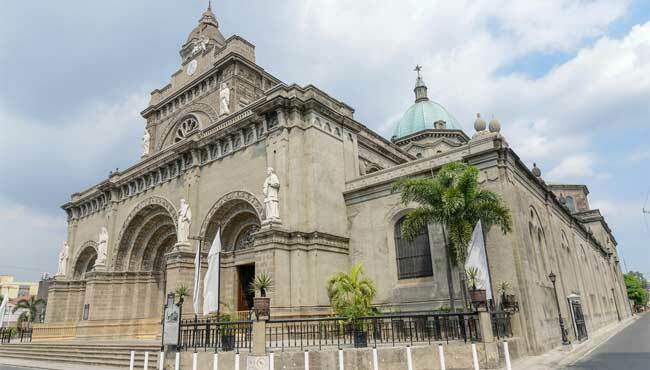 If traveling is out of the question for you this Holy Week, enjoy the beauty of Intramuros, the Manila Cathedral, or the Quiapo Church right here in Metro Manila. Regardless of where you decide to travel for Holy Week, you can rest easy knowing that there will be plenty of family-centered locations and activities where you can relax and reflect during this Lenten season. When going for a road trip, bring along your credit card with the best gas rewards so you can make the most of your travel mileage every time you gas up. Some even offer emergency roadside assistance, discount on consumables such as oil and lubricants, and other benefits that can be useful along the way. If you’re a frequent road traveler, consider getting such a card as the one featured below. 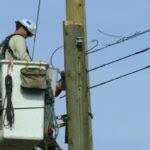 It could get you to save more money in the long run. 5% off on shell products, toll fees, and auto repair and services.